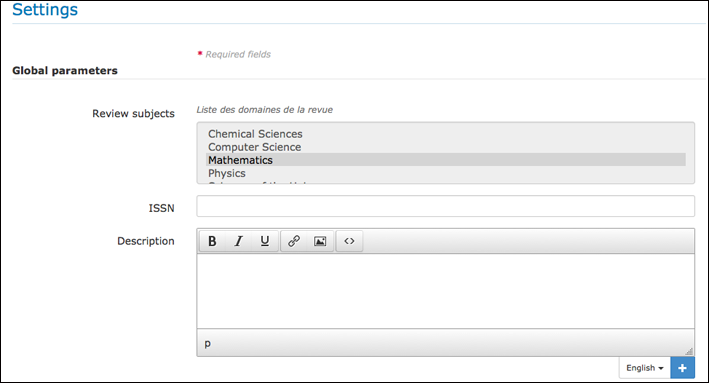 To customize the journal settings, go to the menu Journal management/Review/Settings. They list the fields covered by the journal. Several of them might be selected. To select one field, simply click on it. To select several, hold Ctrl and click all corresponding fields. The ISSN of the journal and a description are also available here. For the moment, those information are not displayed in the journal description. They list the authorised online repositories where pre-prints can be deposited by authors before peer reviewing. The editorial board can set up here the repositories that will link to their journal. Several of them might be selected. To select one repository, simply click on it. To select several, hold Ctrl and click all corresponding fields. or, on the contrary, specify unwanted reviewers. parameter can be defined to allow or to not allow, the communication between reviewers and authors during the evaluation process of the paper. They can be settled to define the time necessary to review an article. A choice is possible between days, weeks or months. This step is necessary if the editorial team need to activate automatic reminders. The delay defined in this place will be useful to start the process of the reminders (see Automatic reminders).